Appleton’s eclectic downtown is home to several specialty retail shops, fine dining and a wide array of ethnic eateries, along with art galleries, museums and nightlife options. Downtown lodging options include the Radisson Paper Valley Hotel, the CopperLeaf Boutique Hotel and the Franklin Street Inn, a bed and breakfast. Appleton is located 90 minutes north of Milwaukee, 30 minutes south of Green Bay, 3 hours north of Chicago, and 5½ hours east of Minneapolis. The Outagamie County Regional Airport serves the entire Fox Cities area with flight services from Allegiant Air, Delta, Midwest and United Express. Take Highway 41 to the College Avenue exit. Proceed east four miles through downtown Appleton. Take Highway 10, which connects with the Highway 441 bypass. Take the Oneida Street exit and proceed north to College Avenue. Take College Avenue east through downtown Appleton. 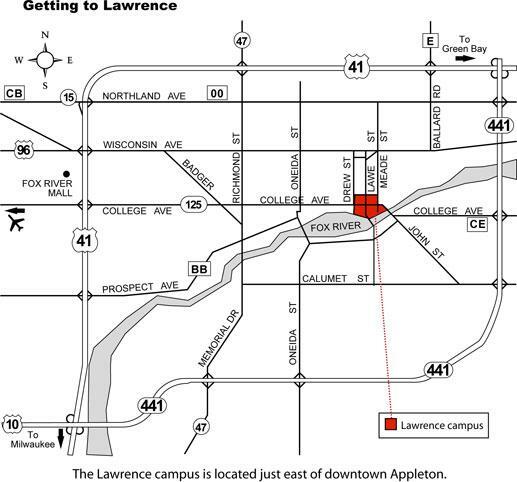 The Lawrence campus is located just east of downtown Appleton. The Lawrence Memorial Chapel is located on the north side of College Avenue. The Music-Drama Center, which houses the Box Office, is just west of the Chapel. Parking is limited but is available on the adjacent streets. There are handicapped parking spaces in the parking lot east of Memorial Chapel.